Posted on December 7, 2006 by Alicia Bay Laurel	in Blog. The street sign at Noe and 24th Streets in San Francisco, decorated for the holidays. 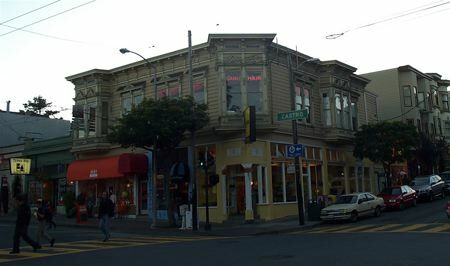 I took at walk on 24th street, the shopping promenade of Noe Valley, an upscale bohemian neighborhood in the Mission District of San Francisco on December 1st. 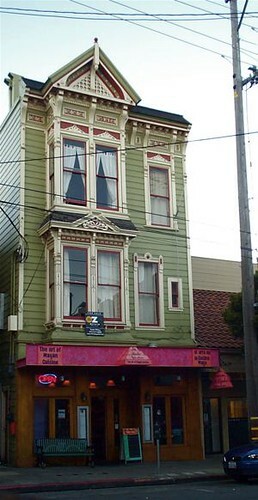 The famed San Francisco “painted ladies,” beautifully restored Victorian buildings with exterior details stylishly embellished to be more visible, house many of the shops. 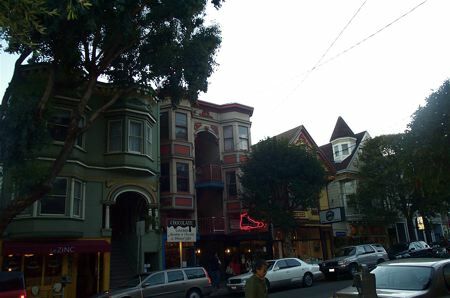 Corner of Castro Street and 24th Street. 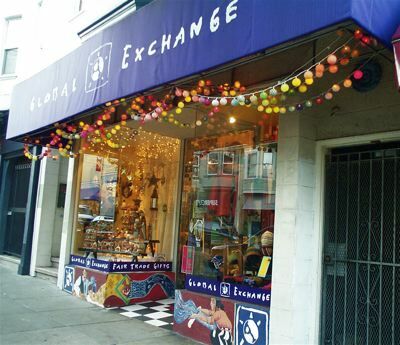 Global Exchange, the Fair Trade Gift Store, features imported crafts and folk art from artisan coops in third world countries, often using recycled materials. As an alternative to supporting local artisans, these tasteful holiday tchatchas rest easy on the shopper’s conscience. 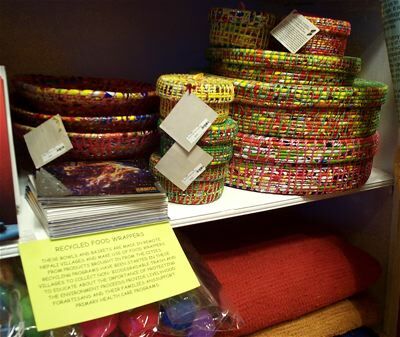 For example, here are colorful baskets made in Nepal of recycled food wrappers. 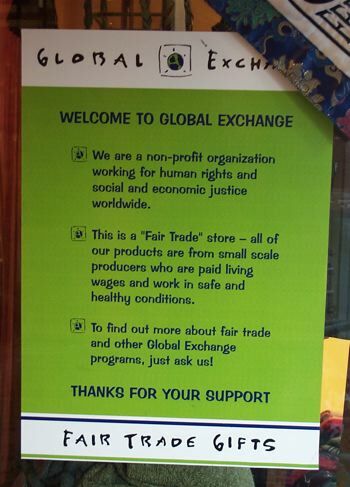 The Global Exchange policy posted at the front door. No sweat shop items here. 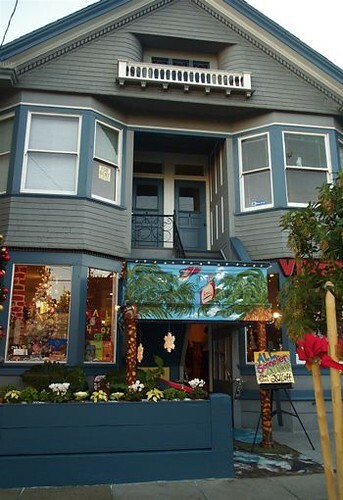 A glorious Victorian building with a Mayan restaurant on the first floor. 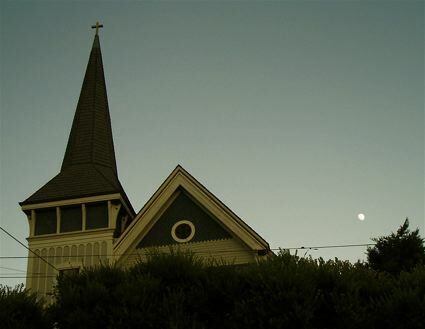 Moon over the roof of the Noe Valley Ministry, where concerts, lectures, yoga classes, bellydance classes and a pre-school share the space with a church congregation. 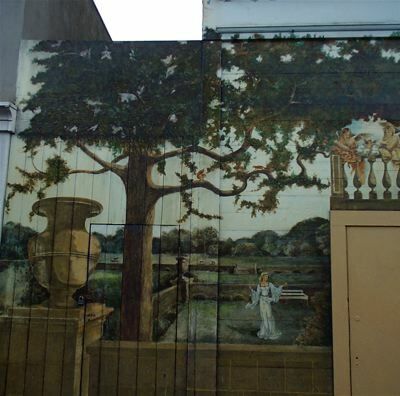 A mural on 24th Street in the Romantic style. 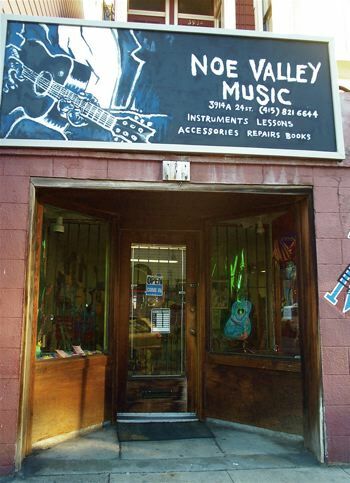 Noe Valley Music, a friendly place to buy a guitar, which used to be co-owned by my friend Dale Miller, a guitarist who, like me, was inspired by John Fahey. 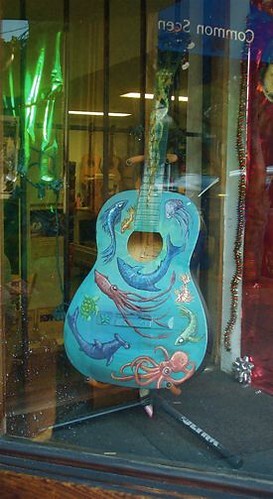 In the window of Noe Valley Music, a guitar painted with sea creatures. 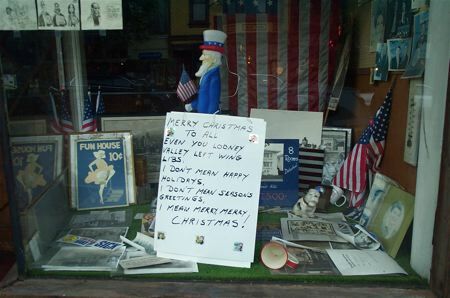 A grouchy right-wing realtor wishes “all” a Merry Christmas from his storefront. 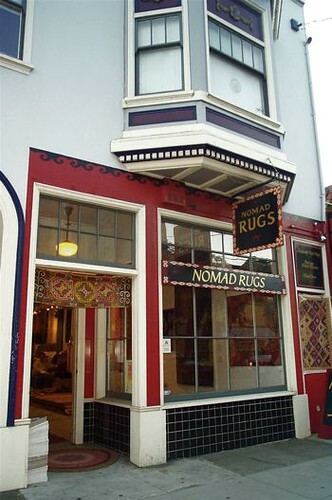 The oriental carpet dealer’s charming storefront.